The provisions of the Tax Cuts and Jobs Act will impact every individual and business. One of the provisions that has not been widely publicized but will have significant impact is the new rules related to meal and entertainment expenses. The TCJA completely eliminated an employer’s ability to deduct entertainment expenses paid or incurred after December 31, 2017. The TCJA also significantly limited an employer’s ability to deduct expenses associated with de minimis meals, including meals provided for the convenience of the employer. A chart is provided below, to summarize proper treatment for many types of meal and entertainment expenditures, under the law applicable both before and after the TCJA. Our recommendation is to be more diligent in the classification of meal and entertainment expenses for 2018 and beyond. 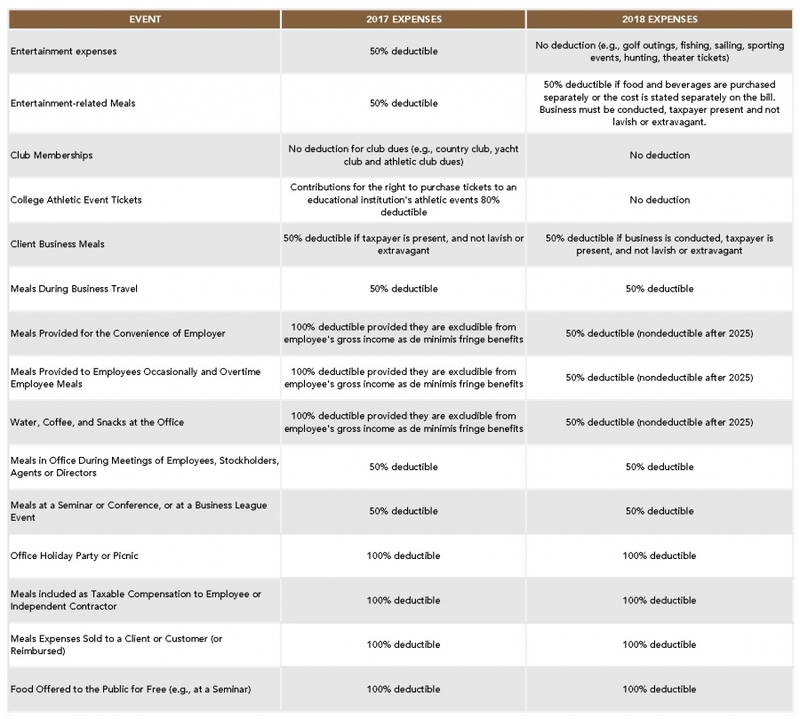 Since some of these expenses will no longer be deductible, these expenses should be segregated into different accounts for tracking (e.g., 50% meals, 100% meals, and non-deductible entertainment). Click here to download the complete Meal & Entertainment Expenses under the Tax Cuts & Jobs act flyer. If you have any questions, please contact a Saltmarsh Tax Advisor. David is a shareholder in the Tax & Accounting Services Department of Saltmarsh, Cleaveland & Gund. He has over 25 years of experience working with growth-oriented companies and business owners in a variety of industries, including manufacturing, software, professional services, real estate, technology, and creative services. Tax Scams Across the Nation Part Three: Have You Seen My Tax Refund?